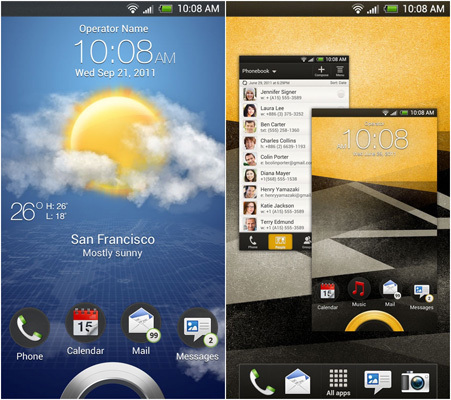 The folks at Android Central managed to get their hands on a RUU (ROM Update Utility) for the HTC Endeavor and extracted dozens of screenshots for the upcoming version of HTC's Android skin, Sense 4.0, which will be running on top of Ice Cream Sandwich. Although we have seen Sense 4.0 once before in a video, these screenshots give a clearer view of the interface. What you see below are screenshots of some of the built-in themes in preview mode, where you can see how the homescreen, lockscreen and application screen will look like once the theme has been applied. We can see that the lockscreen is almost identical to the present versions of Sense although you can change the look of the lock ring and the application icon background with different themes. We noticed that the font for the large clock strangely is not Roboto, even though the rest of the OS is using it. The homescreen looks a bit different, due to the presence of a new dock at the bottom of the screen that houses shortcuts to applications, which is more functional that the current dock in HTC phones. 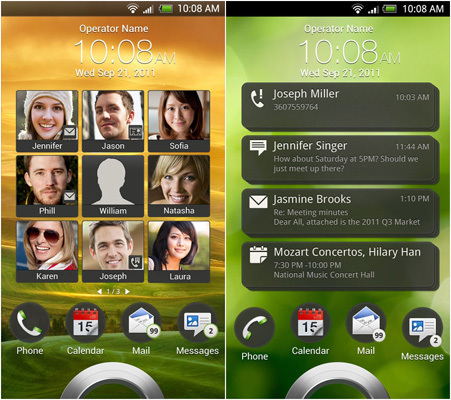 We think the new Sense 4.0 does look very nice. The lack of overly glossy surfaces also makes it look more mature and sophisticated. 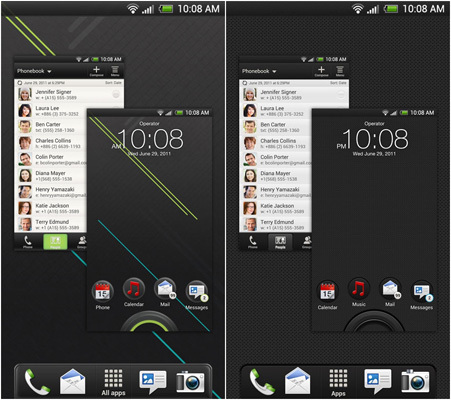 If at all we must have a custom skin running atop our Android devices, Sense 4.0 would probably be our first choice. And since it is unlikely that HTC will ever sell an Android phone without its custom skin, it's important for the skin to be good, which it seems it is. We just hope it won't take too much of a toll on the performance of the phone. For more screenshots, you can check out the source link below. Also check out the video if you need a more in-depth but blurrier look at Sense 4.0. You do realize it's not the final build, so it's not going to be properly optimized for android 4.0 or the hardware. It's sense, not android that's the problem. did anyone see that lag while scrolling? ICS was supposed to obliterate that??!?? !